What a find! A warm, inviting home plus a wonderful guesthouse, privately situated at a convenient location. The quiet backyard features a recently resurfaced pebble tec pool surrounded by lush desert landscaping designed by an arborist from the Botanical Gardens. The main home features 4 bedrooms and 2.5 bathrooms. The master bedroom received a generous addition w/ a new bathroom. 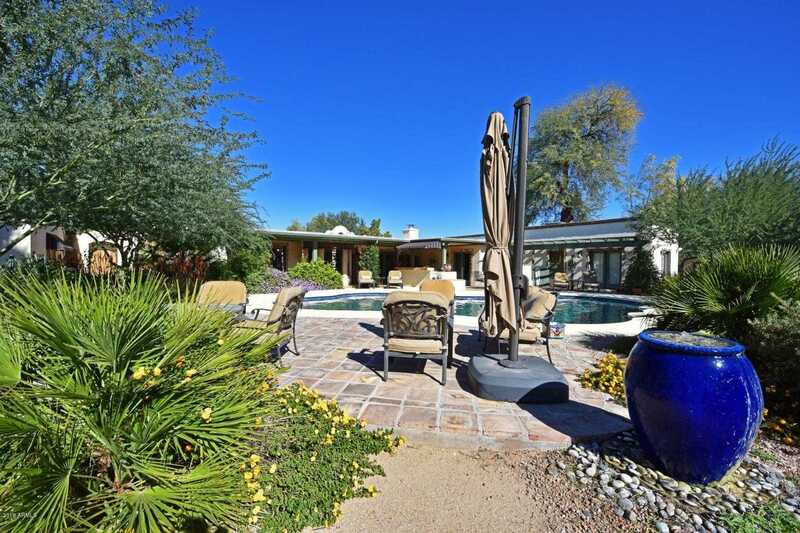 In 2010 guest house was built, the casita has a full kitchen, spacious living area, master bedroom w/ 3/4 bath, 1/2 bath as well as an exercise room and office that could easily be converted to bedrooms. The casita could be used for parents/guests/long term visitors/office. The patio has good seating space, TV hookup and speakers. Comfortable southwest ambiance with extensive built-in book shelves throughout. Directions: From Shea, turn south onto 68th St, drive 2 blocks south to Beryl Ave, home is on the southwest corner of 68th and Beryl. Approximate size: 34984.00 sq. ft.